Our Golden Retriever puppies are sold with spay/neuter contracts and AKC Limited Registration. Our Golden Retriever puppies are required to be registered with the American Kennel Club (AKC). They are not permitted to be registered with any other registry. However, our Golden Retriever puppies are eligible to complete for titles in Obedience, Agility, Hunt Tests, Field Trials. In addition, they can get a Canine Good Citizenship certificate. Furthermore, they can be certified as a Therapy dog if they qualify. For example, Therapy Dog International status. 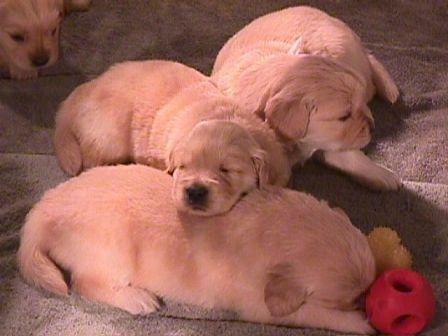 Golden Retrievers puppies can make wonderful Therapy Dogs or Search And Rescue Dogs if properly trained and qualified. Initially, we ask you where you are located and if you want a male or a female Golden Retriever puppy. When interested, we send you an essay question as we do not do formal questionnaires. Please give us as much detail as possible in your response to the essay. We need detail in order to make our decisions on which families to choose to receive an invitation for a puppy reservation and deposit. Consequently, first impressions are very important. We will be considering you as a potential ‘fit’ for one of our puppies. With an acceptance to our invitation, you are making a life long committment to your new family member. Please note, we do not take names on a waiting list. We please ask that you to check back with us for updates during the pregnancies, whelping, and raising of the puppies. The families we consider to invite for a puppy reservation are in no order but who we think will be the best homes for our Golden Retriever puppies. Our decisions are based on all correspondence we have had with each family. Once a litter has arrived we will know exactly how many puppies we have and the gender break down. We then review our prospective family’s essays once again to make our choices on which families to send an invitation. We may have further questions for you at that time as we are typically fortunate to have more inquries than puppies potentially available. Deposits are non-refundable. To First and foremost, the “Meet & Greet” is mandatory as a visit with us when the puppies are 5 1/2 – 6 weeks old. Specifically, it is only for those families who accepted our invitation for reservation and we received their deposit. Above all, this procedure ensures our puppy’s safety from any outside virus’, bacteria and/or other communicable diseases. Immunity to any disease such as parvo/distemper is totally dependent on the colostrum received at birth from their dam. Therefore, we have very strict ‘rules of the visit’ when having people out for our “Meet & Greet” and also for “Go Home” weekend. Only immediate members of the family residing in the home attend. It is a breeder’s responsibility to properly educate potential puppy buyers and answer their questions. Please remember, there are no questions that you can ask which we shouldn’t be able to answer. 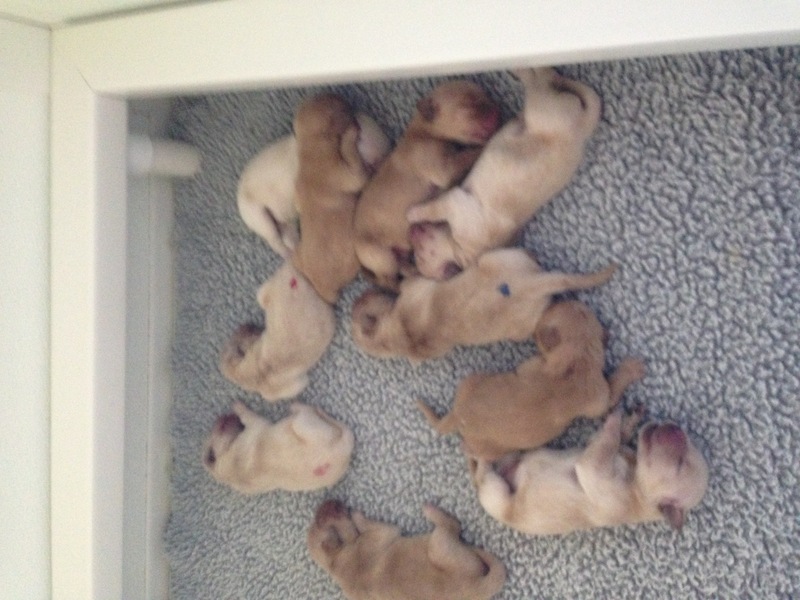 Our Golden Retriever puppies are raised in our bedroom/family/living room areas in our home. 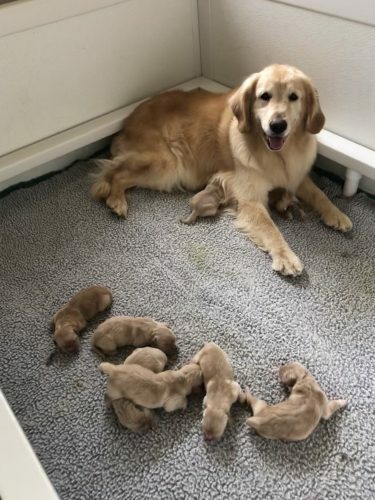 In the beginning, the first 4 weeks they are in a Jonart Whelping Box with an attached open pen so Mom can get in and out and the puppies are safe in their area. Subsequently, at 4 weeks, we move the puppies to our formal living room. 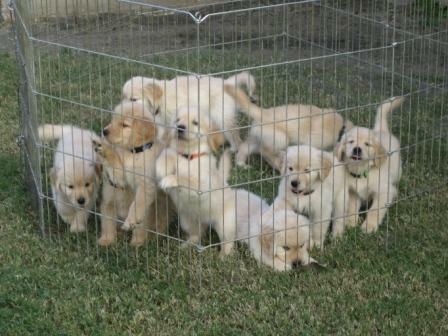 Their playpen is an approximately 8′ x 8′ playpen where the puppies can see and hear everything around them. 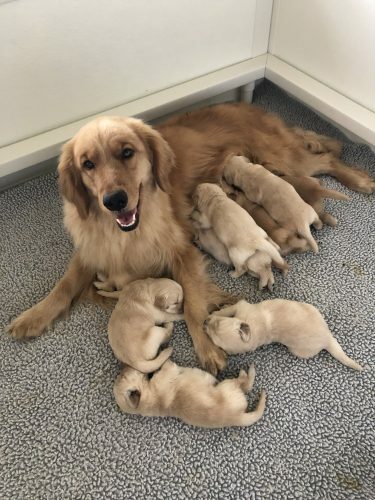 That location offers our Golden Retriever puppies optimum opportunities for socialization which is a necessity for puppies at this stage of their life. Finally, our Golden Retriever puppies are ready for their new homes at approximately 7 1/2 -8 weeks. As a result, the puppies are exposed to most household noises that await them with their new family. Goldenwind Golden Retrievers have the health reports required by the Golden Retriever Club Of America Code Of Ethics. 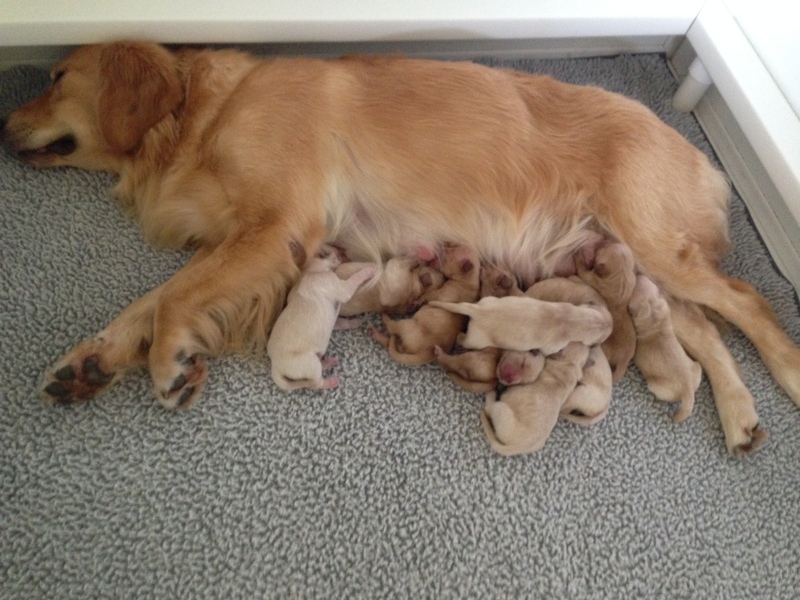 Be sure to ask a Golden Retriever breeder for ‘health clearances’ on both the sire and the dam of the litter. These reports need to include an OFA Hip rating of ‘Fair’, ‘Good’, or ‘Excellent’ and an OFA Elbow rating of ‘Normal’ The eye report needs to be from a Board Certified Canine Opthalmologist either indicating ‘normal’ in both eyes or with a notation of ‘breeder option’. In addition, a Heart Clearance from a Board Certified Canine Cardiologist indicated ‘normal’ is necessary. For more information on Golden Retriever Health Clearances please visit our “Health” page. Copyright © 2018 Goldenwind Golden Retrievers. Reproduction in whole or part in any form or medium without express written permission of Goldenwind Golden Retrievers is strictly prohibited.